Well my friends, here we are again, presumably for the last time. Much time has passed since my last article (which you can read here) has come out. Since then, Freddy Fazbear and his furry little friends have managed to make the third game one of the most anticipated in gaming history. 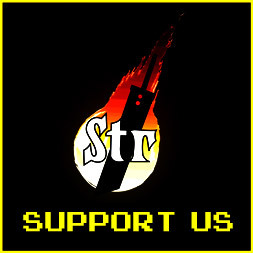 Since I’ve already covered the developer, Scott Cawthon in the last article, we’re going to skip him and move straight to the story. I want to start by apologizing about never explaining the “slick veneer” covering the TRUE story that occured at Freddy Fazbear’s Pizza all those years ago. Sometimes in the previous game, after you die, you could play a minigame in Atari graphics. These “Death Minigames” as the fan community called them, were most crucial in uncovering the Five Night’s at Freddy’s storyline. When playing some of the minigames, you encounter a purple colored man who was implied to have killed all of the children in the “Missing Children Incident” that I briefly mentioned in the previous article. Anyways, on to the current game. This game take place 30 YEARS after the first game, in the “far off” year of 2023. Freddy Fazbear’s Pizzeria has been left to rot, and some horror enthusiasts have decided to cash in on the scariness of the fuzzy singing animatronics. They establish a new horror attraction on an abandoned theme park named “Fazbear’s Fright, the Horror Attraction”. It’s a week before opening, and your first night on the job begins. You hear a new voice who sounds more radical than Jeff Bridge’s “The Dude” character from The Big Lebowski. He informs you about some new relics that he has found, a Foxy costume head, some drawings, vintage audio tapes, Bor-ing! But then he says that they found one, a REAL one. With that he leaves you with your night guard training and your devices at the ready. After the “Phone Dude” leaves, you hear a very friendly, familiar voice. The Phone Guy is back on these training cassettes, and he tells you about this new animatronic locked in with you. He explains that there are actually two suits that were made by the company back in the day that could be worn by people by using a convenient little crank to push the endoskeleton parts aside and make room for someone to climb inside. One which he calls “Spring Bonnie” is the one locked in with you for the rest of your five nights. 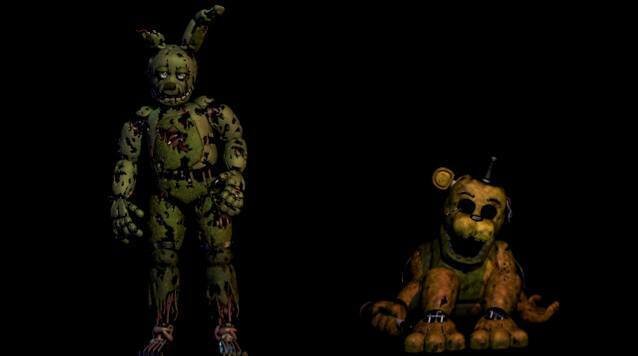 As we found out from the various teasers and the game’s extras menu this new animatronic’s name is Springtrap, in reference to the spring lock mechanisms used to make room in the suit. Throughout the nights you hear only more of him, explaining that nobody is allowed to wear the suit as just breathing on the spring locks will lubricate them enough to set them off. He then says that they will seal the suit off in a back room that is not on the animatronic’s digital maps, or on the security guard’s map of the pizzeria, thus explaining why this animatronic never appeared in the previous installments of the franchise. But wait! There’s more, as after each night you can play more minigames! These take place in the same pizzeria as the first game, which has been abandoned by the company with the animatronics aimlessly wandering around. After dismantling Freddy, Bonnie, Chica, and Foxy. You play the fifth and final night as a soul of a dead child, and join the other souls of dead children to confront the Purple Man in the back room that was sealed away. He hops into the Springtrap suit as a defense, and laughs, lubricating the spring locks and setting the animatronic parts loose, killing him instantly. The souls leave, forever free, and leave the purple man to spend the rest of his existence as a creepy, possessed bunny animatronic. Yeah, scary considering we saw his corpse in the rare screens that occur during the game. If you thought that was the end of it, you’d be dead wrong son! 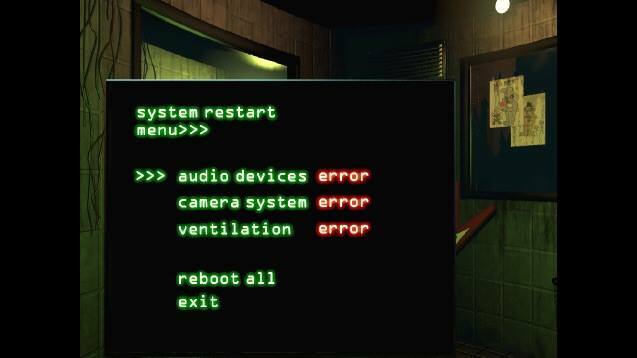 Much like the music box from the previous game, you must reboot systems like cameras, audio, and ventilation, otherwise certain death is in store for you. 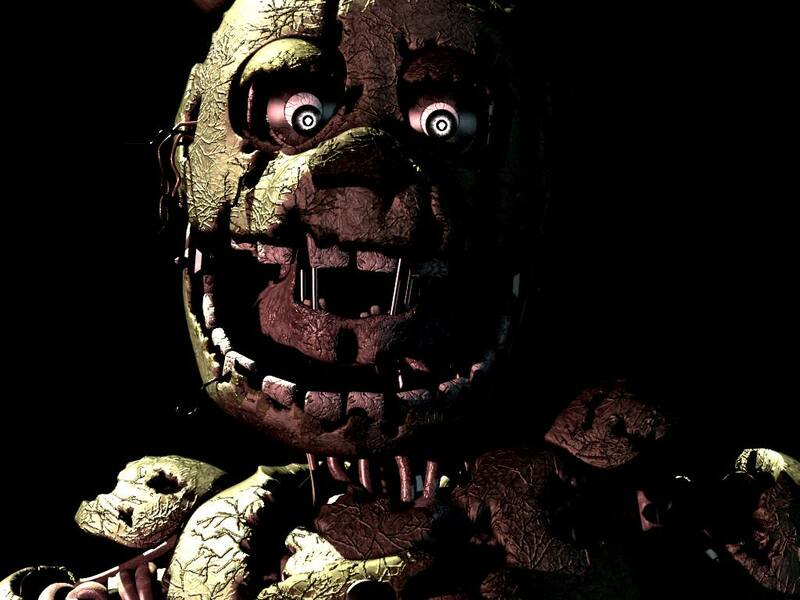 If your camera system has an error, you can’t see where Springtrap is, if the audio system has an error, you can’t lure him away from your office, and if ventilation goes down? Oh boy, that’s when the fun really begins. As some fans recall, all of posters and ads stated that there was only one animatronic. That is TECHNICALLY true, as there’s only one that can kill you, that being Springtrap. There are however, phantom animatronics, lingering hallucinations of the previous inhabitants of the old pizzeria. They are triggered by certain events in the cameras, and will cause systems and lights to go off, luring Springtrap closer to you. 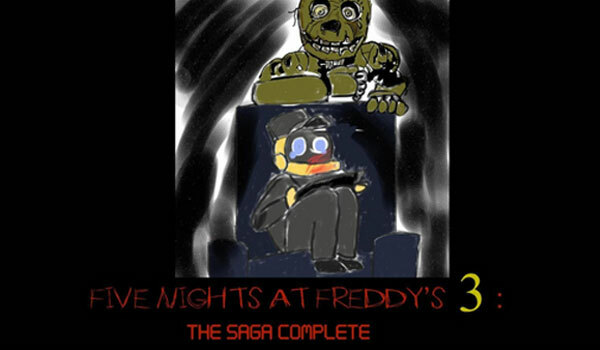 This is the first game that actually features multiple endings, theres a bad ending that you get from just playing the five nights straight, and there’s a good ending that you achieve by playing various minigames hidden throughout the nights. And then there is a “secret” ending that you get from beating the sixth night, or “nightmare” as it’s called in this game. I won’t spoil this one, but it’s a good’n. In the end does all of that really matter? The point is that the children got revenge on their murderer, and he will suffer for his crimes. I will always remember and cherish this fantastic horror trilogy for its relatively good use of gameplay and easter eggs to tell it’s stories. Hats off to you, Scott Cawthon for making an addictive story out of a horror game, something that’s rare to come by these days. 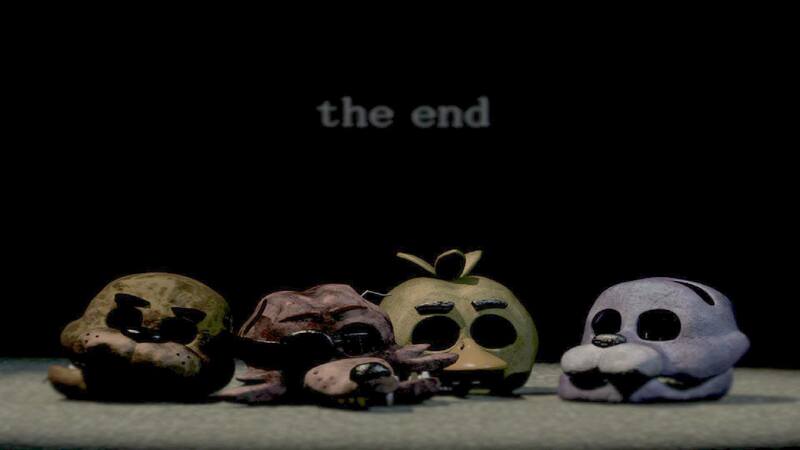 So I guess that’s it for Five Nights at Fred- wait, what? Ah, I can’t quit my addiction to this game, farewell my friends, see you on the silver screen!